As we have slowly made our way from room to room transforming each space into our own personal style, the upstairs hallway felt like the perfect small scale project in between a few larger projects we have planned. 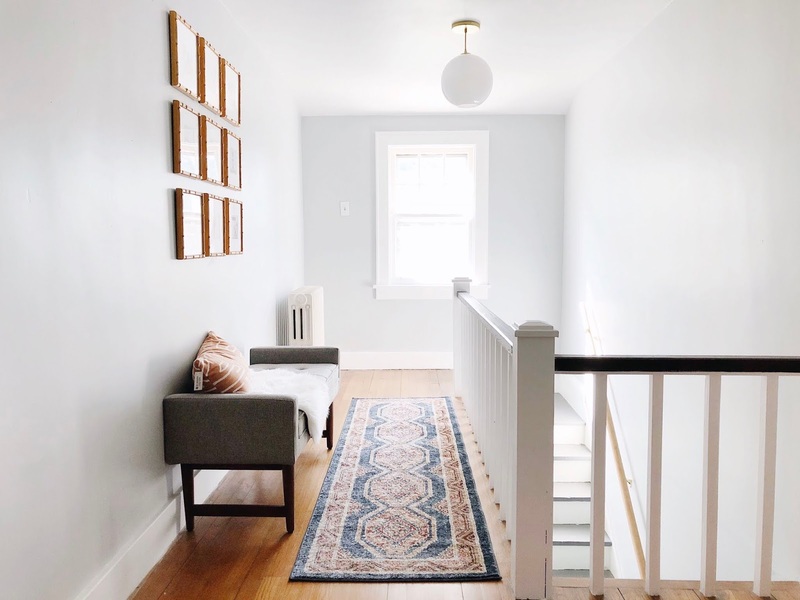 The old attic space of the home had been previously turned into an open stairwell, hallway, two bedrooms and a half bath. The hallway was left a blank slate. White walls, hardwood floors and an outdated light fixture. The starting point for the design came from the idea of hanging a gallery of pictures of the girls. With the help of Framebridge and the launch of their new mini gallery series my gallery dreams came true. I chose the mini gold gallery created from from nine 11" x 11" Mandalay frames. The gold frames were the perfect accent for the space and the room quickly came together around them. When it came to the paint, we decided on the same Sherwin Williams Passive that we have used on the first floor living room and entryway. It feels light and bright but shifts to a warm gray in the shadows. The trim and railing were painted a bright white to match the rest of the house. Immediately the space felt so transformed. The last steps for this quick makeover were deciding on some decor and a new light fixture. Wanting to keep the budget for this project to a minimum, I shopped one of my favorite stores. Target. An antique inspired runner, mid century modern bench and decorative accents for the bench were the perfect touches to the space and the girls have loved sitting and reading throughout the day. One other item that we have loved for the space is our wood growth chart from White Loft. It is the perfect personal piece to capture each stage of growth for our girls and is so cherished in our home. It fits perfectly in the nook between the two bedrooms and the new paint color really makes it pop. I look forward to years of memories it will help us create. For the light fixture we wanted something modern that would stand out while also blending in to keep attention on the gallery. After much contemplation, we purchased a milk glass globe pendant from West Elm. The gold accent on the cord and ceiling fixture would play off of the gold frames nicely. The impact the updated light has made on the space has been amazing. It really pulled everything together and gives that mid century vibe we were going for. Love how this space came together! That bench is perfect.